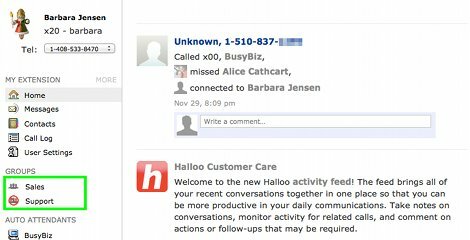 You can block or accept calls from a Hunt Group in the My Halloo summary page. By blocking calls when you are unable to take calls, the system will automatically go to the next person in the rollover, speeding up the hunt process. The left column on the My Halloo website will list hunt groups to which you have been assigned. You can temporarily block calls from a particular group by clicking on the small icon to the left of the group name. (See the green highlighted box above). In the example above, Barbara is accepting calls from the Sales hunt group, but blocking calls from the Support group. As a default, all new members of a hunt group are blocked. Click on the group name itself to see all members of the group and their current status.